More On Pointcrawls — and Thoughts on Pointcrawls for Traveller | Tales to Astound! This entry was posted in Uncategorized and tagged Adventure Gaming, Classic Traveller, Game Tools, OSR, RPG, Traveller, Traveller Out of the Box by ckubasik. Bookmark the permalink. Good point. Most of my off the cuff maps (and I bet lots of other people’s) are like that. Never thought to do it for a starship. What a timesaver! 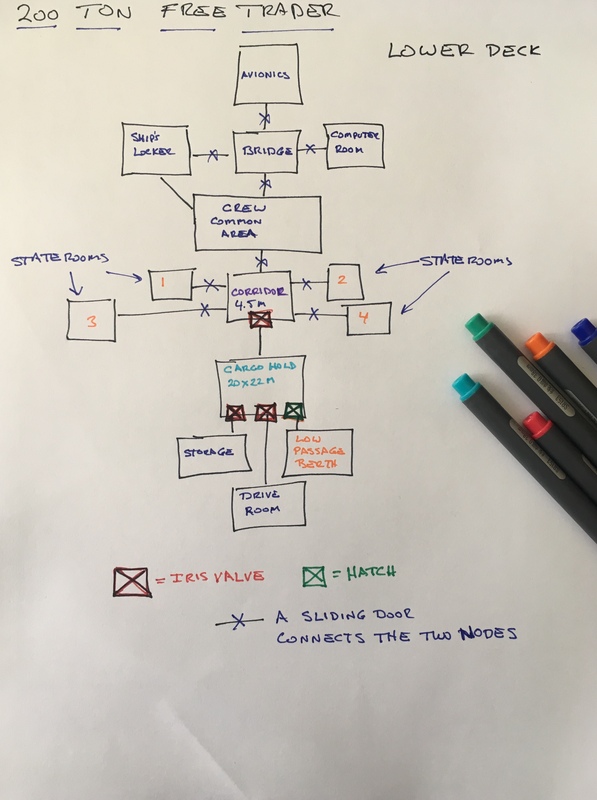 And it reminds me of the node maps I used to make playing ‘adventure’ style computer games. This is like DGP’s use of the “nugget” format. Clever use of the idea for deckplans, though! 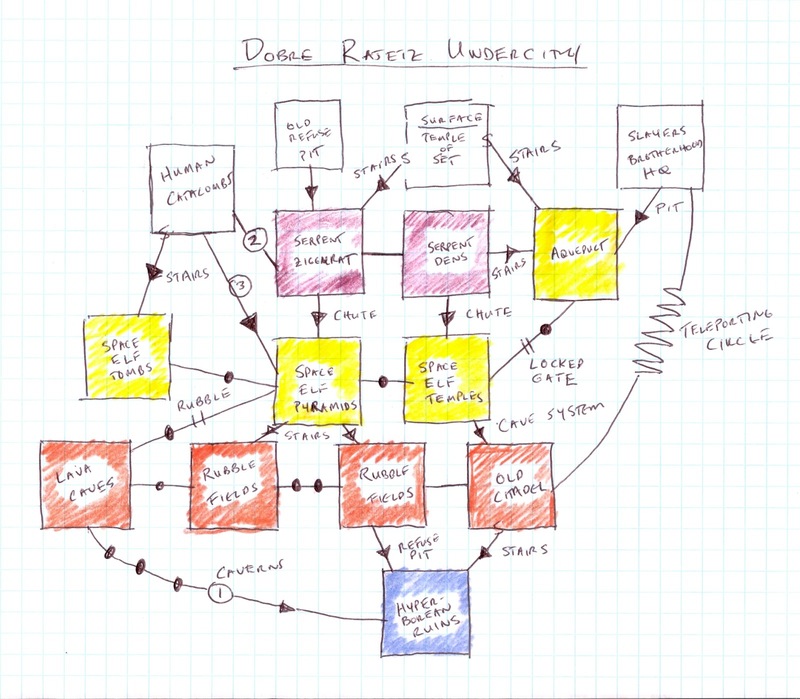 While I can see how there are visual similarities between the pointcrawl diagrams and DGP’s Nugget format, I need to point out that they are not the same thing at all to avoid any possible confusion. The Nugget format was one of several formats created for a publisher to write and nail down an RPG railroad. Even if there are “side tracks” available, the Nugget system depended on scenes that “have to” happen, and the scenarios are designed to force the Players/Player Characters along certain expected paths and toward certain climaxes. While I appreciate many people do like this style of play, refereeing and RPG prep, it is not a style I like at all, and I’d never do anything to advocate such play. Instead, the pointcrawls are terrific notations for the Referee for handling and keeping track of where the PCs can go, how long it might take, what the options for movement are and so on… all without getting bogged down in creating the detailed maps that we a) all LOVE; and b) can be quite time consuming and create a prep to play ratio that some people might find onerous. Pointcrawls used as a notion for geography don’t dictate any order of events, expectations for the night’s session, or any kind of story. The PCs might travel between two nodes back and forth all night, and the Referee has no expectation of any other nodes they should go to. Instead, what I am advocating is in a game where the Player Characters can travel between worlds in a moment’s notice, or jump in an air raft and traverse a chunk of a continent, or arrive at a whole new city the Referee hadn’t prepped for at all, a system for setting up major points of interest and methods for tracking travel times and routes with nodes and lines makes a lot more sense then expecting the Referee to whip out a sheet of hex paper and craft an entire new planet or metropolis. Even if used as a tool of pure exploration, the purpose of the pointcrawl is *not* to guide or steer the PCs along a certain path or set of encounters. It is to make the Referee’s job easier in terms of tracking geography in a more efficient method. It has nothing to do with forcing the PCs along certain paths or toward certain scenes or encounters the Referee can’t wait for the PCs to reach. While I appreciate the that details of the situations are more clear laid out than the presentation in JTAS, again, I never assume I know what the PCs are going to end up doing, caring about, or driving for by the time the game is underway. But I appreciate the method does work for many people. 1) In defence of the nugget format, which I quite liked, it is a tool just like so many others – so it didn’t always get used quite the way it was intended. I used it to help come up with a structure that became a guide for running scenarios. It was a long time ago now – but I remember clearly that with the people I game with, getting them to follow a plot line is like herding cats. Letting them, if they discover & choose to follow, is fine. I tried it when this first became popular, and for me and my friends it mostly didn’t work. But I found using the DGP nugget style helped me be better prepared. I just learned to be prepared for the scenes that ‘must happen’ not happening, and if things were a bit too rigid, I adapted them prior to play. IE I avoided the railroading behaviour (mostly) that they encouraged. I’m not sure anything ever played out as originally conceived and written, whether it was purchased or home grown. But the planning always helped. Mainly to warm up my mind, I think. So are there any special things you do for coping with the PCs being able to go anywhere? Other than using the rather excellent inspirations in the CT tables? Do you pre-roll a few patrons or NPCs, for example? I’m curious because I’m finding it harder to ‘wing it’ these days. Can you tell me what you think I mean by improvised? Because what I mean and what you mean might be two different things. I provided the players with a situation: a map to a valuable relic on a world caught up in conflict; and pirates on the trail of the PCs. I had no idea what would happen after I handed off the situation. No path. No climax planned. Note that the pirates NEVER SHOWED UP. I had no idea the Players would get themselves hired as part of the local militia and so on. I didn’t go in with nothing. I went in with a situation, conflicts (some directed at the PCs (pirates), some not (the local war), a possible goal, and the awareness the Players might well make up THEIR OWN GOAL that I could not possibly anticipate. With these pieces in place I began, creating new PCs, locations, and situations on the fly. Note that creating characters in Traveller is a snap. Six characteristics, maybe a skill or three, and your done. I don’t think there is any RPG where stat-blocking and creating characters is easier. Which is one of the reasons why I feel so comfortable creating adventures on the fly — the game was built to do this. 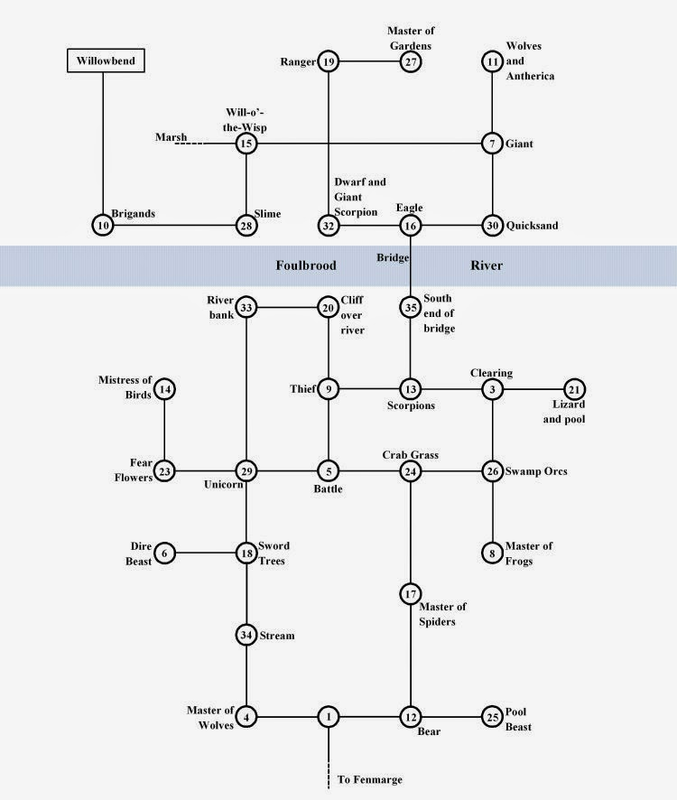 I’ve given the point-crawl format a try with an adventure location I’m working on for an upcoming game. It looks good, and goes so much faster than graph paper and rulers. But I still like graph paper & rulers. I may not use them for everything, though. If my player’s group get a ship, it deserves proper deck plans b/c they will use it all the time. But a once-and-done location can be sketched in minutes with this method. Thanks, Chris. I’d be interested to hear more about how the pointcrawl works in actual play. My question is how does the referee communicate the options to the players? In some circumstances it might make sense to share an edited version of the pointcrawl, e.g. a list of points of interest in a city or district. Other times that might not work so well. Grateful if someone could point to some actual play examples, or share other thoughts on how it could work. I haven’t done a point crawl, but for a city, I would expect one way to navigate is to get directions from an NPC. You might be able to get optional directions so as to navigate the different routes. 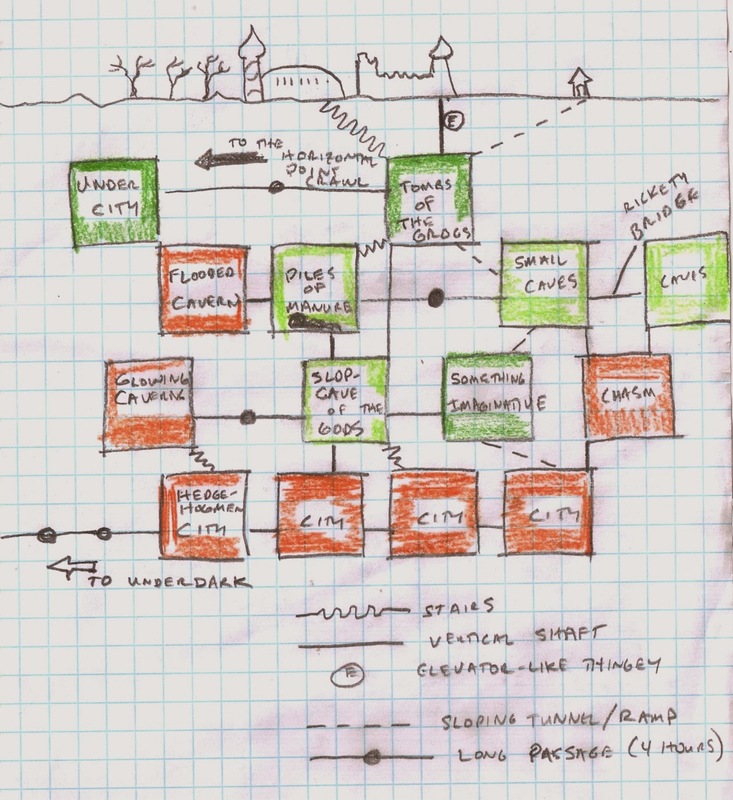 Over time, the players will build up a knowledge of the city and it’s connections. For wilderness, you would be presented with options: follow the road, follow an old game trail, work your way along the river (or take a river boat of some sort), etc. Look at non-hex wilderness maps, how would you navigate them? Actually, looking at that again, it’s a really good example. The one thing that it doesn’t show that could be valid is a route on the river at the bottom of the map, but it does show how a point crawl could work for sea travel. to the Players. The Referee (in the first stage, I suppose we might call it) simply describes to the players what is before them. There’s a long, studied history of this kind of play in RPGs. A second option would be to have a second sketch, a rough one, on a sheet of paper, set out on the table, that the Referee keeps building as more information is recorded and the Players want firmer data. The third option is for the Players to take notes and build their own diagrams and maps as they decide things are important to keep track of. Again, this is how RPGs have worked for decades. Here’s the thing: If people (the Referee, the Players) really *want* a detailed map, one can be made/found/provided. I’m not arguing against having a fancy deck plan for the Player’s Ship. I am saying that thinking one has to have a detailed map of *every* location that might show up in a Traveller game not only is daunting but might well waste a lot of time. I also know (because its a hot topic in RPG circles these days) that in lots of groups the Referee simply places maps in front of Players a lot of the time. (This seems to be especially a part of hangout /Roll20 play.) I understand why people might do this — but I am specifically talking of a kind of play where the Referee describes and the players take notes and make maps on their own as they see fit. Also, I understand maps will certainly be helpful in certain tightly tactical situations. I also believe some groups will be find with more “Theater of the Mind” play without needing detailed, gridded maps. Interesting observations. I’m going to have to try a pointcrawl. Thanks for the reference example on improvised play. I think my idea of improvised is quite similar to yours. Perhaps not as precisely formulated. I’m just not as practiced either I think. Thinking about the pointcrawl stuff, I realise I generally run cities as a point or zone crawl. Not streetplans, or grid/hex movement. Just zones to move through from source to destination, with encounter rolls based on situation. Detailed maps aren’t actually that detailed, mostly enough for some tactical considerations to come to bear, cover & obstacles to be identified, and then semi-theatre of the mind like. World’s or the starport are the same. Just never thought to really do the same for a starship. Which, in hindsight, is perfectly reasonable.